"Thermally it has been A1. 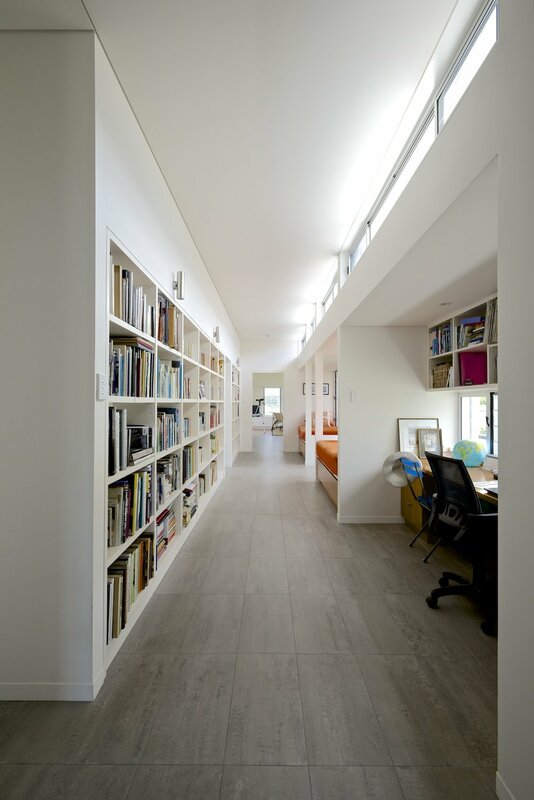 The flooring in the living area, has heated the whole end of the house to 21 or 22 deg regardless of outside temperature. The heat lingers through the night." "Our dog loves the warm floors!" 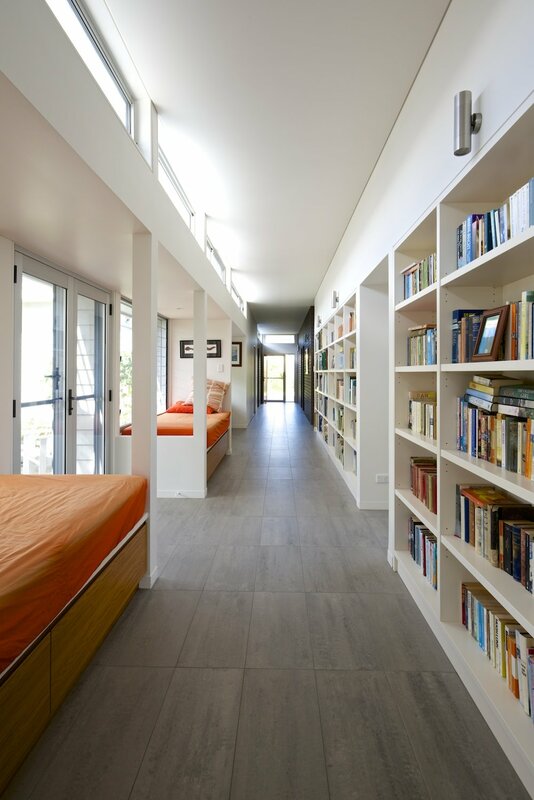 "[The builder] has also remarked on how warm it is indoors at our place. I have saved hundred's of dollars in heating costs. Today I was dressed in shorts and T shirt inside but it was windy and about 17deg outside." 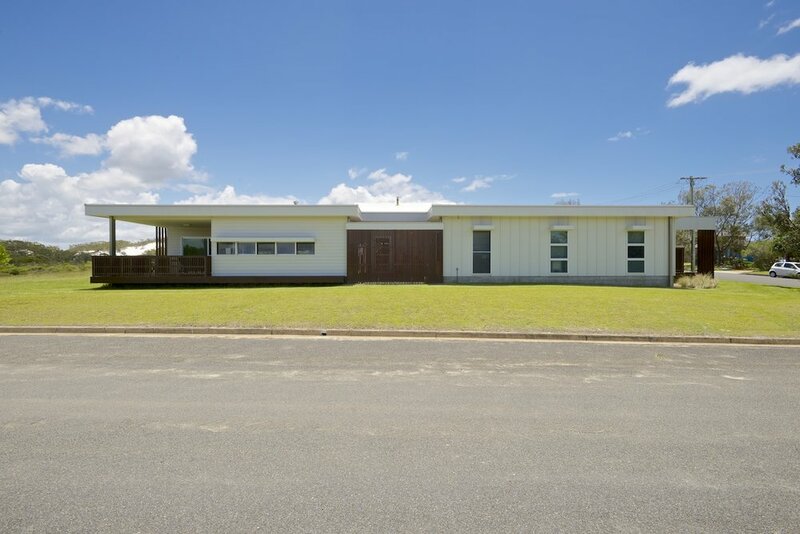 To design a house in a beautiful coastal location, where a professional couple could retire and enjoy the company of their visiting family members and take pleasure in their various hobbies. The site is flat and exposed to winds from the east, south and west, and had strict height covenants imposed by its neighbour to the north. The challenge was how to create a true home that was comfortable and delightful in this wonderful place. An extended plan along the east-west axis, providing space around a sheltered north facing courtyard, ensured optimal exposure to the north. 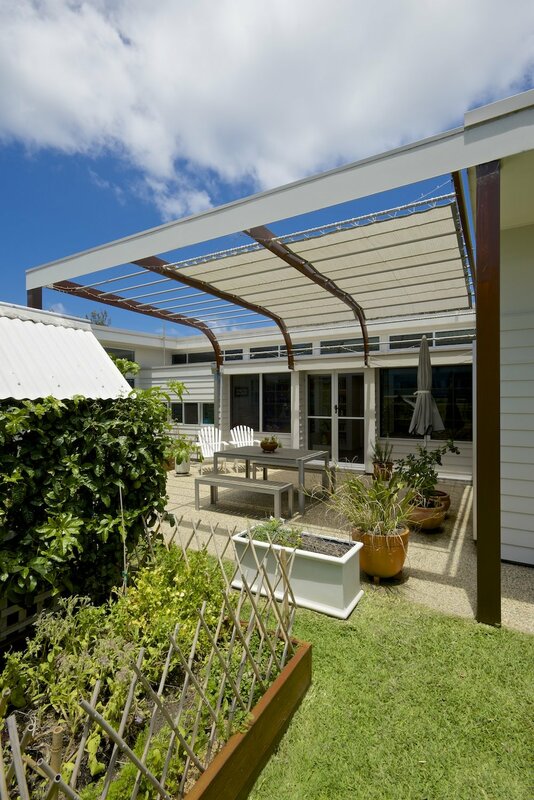 Roof overhangs and a sculptured pergola provide both good solar control and privacy from the neighbour. Bedrooms have been located at the main entry to the east, with the main on the north side and guests on the south. The living rooms terminate the activated hallway - which supports a workspace and daybeds - where they can enjoy the panoramic views to the west. 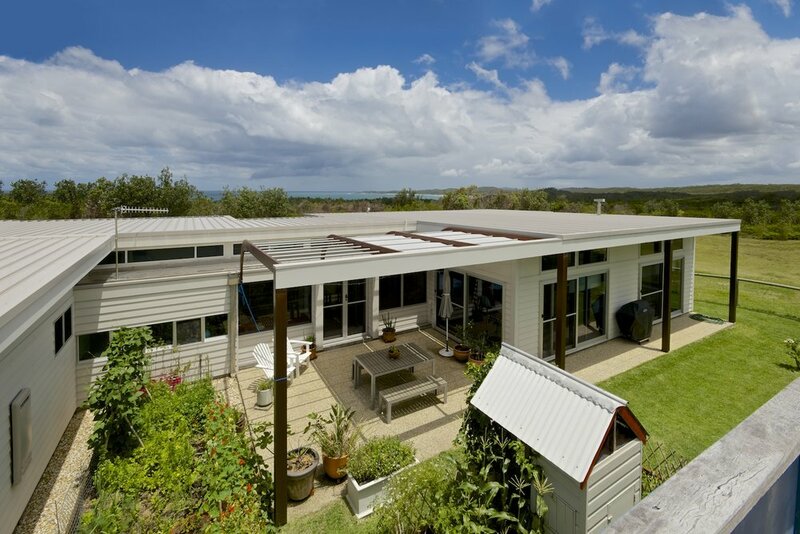 A covered verandah to the south-west ensures enjoyment of this most spectacular outlook, when the weather permits. 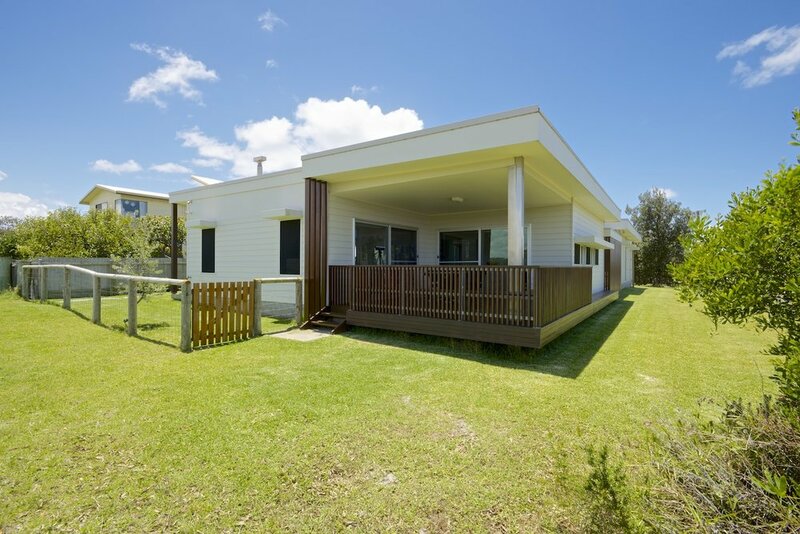 A service courtyard on the southern side provides space for all the practical requirements of a beach house, including an outside shower, storage for surfboards, a discrete place for recycling, rubbish and drying clothes. 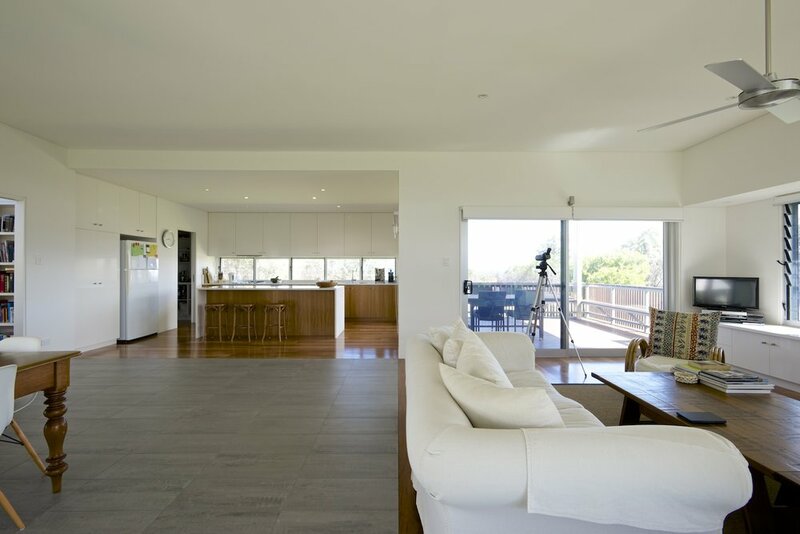 Tiled and timber floors throughout house. Low VOC particle board for joinery. Solar hot water heating with gas boosting. 1.2 kW photovoltaic system for energy generation. 18,000 litre water tank connected to toilets, washing machine and landscape. Timber from sustainably managed forests for framed windows and doors. Size of project purposefully kept modest.